I’ve lost 17lbs since the start of September. This is a lighter October than last year or the year before. I’ll rewind to a point last Summer where I watched “Fat Sick and Nearly Dead“; at the time I thought it was a great film (it’s available on Netflix) but I didn’t connect Joe Cross’ lifestyle to mine. After all, I’m “Wholesome” and I eat healthy food; why would I need to watch what I eat more closely? Then we went to the Aran Islands and I struggled with the climb up to Dun Aonghusa. I was out of breath, and then when I looked at photos we’d taken up the top I realised I couldn’t share them on the blog or social media. I am so upset with myself. I am the only one who is in charge of my health and I let things get this bad. See the thing is, I wasn’t eating a healthy diet, I was eating far too much food. It was all great, filling, wholesome food, but I wasn’t sticking anywhere near the RDA (recommended daily allowance) of calories for an adult. I also wasn’t moving enough. Combine not getting enough exercise with eating too much food and there is only one outcome. I used a couple of free tools to monitor my progress and I’ll share them with you very soon. I don’t want to overload readers with information. I may even vlog it! Regular readers will have already noticed that there has been a change to the recipes I’m sharing. There are less sugary-baked goods and that’s because we’ve decided to cut back on sugary treats but we’re not cutting it out completely. At mealtime portion sizes have changed too and believe it or not, we are saving money on the food bill because the adults in the house are eating less. Imagine that! Here’s a big confession. The mail-order dress I got for my book launch in April was too tight and I had to buy a second dress so I’d fit into one on the night. It was a size 20. Today I pulled on a size 14 top and it fitted like a glove. I can’t remember the last time I wore size 14. Right enough giving out to myself in public. I can do that again another day. 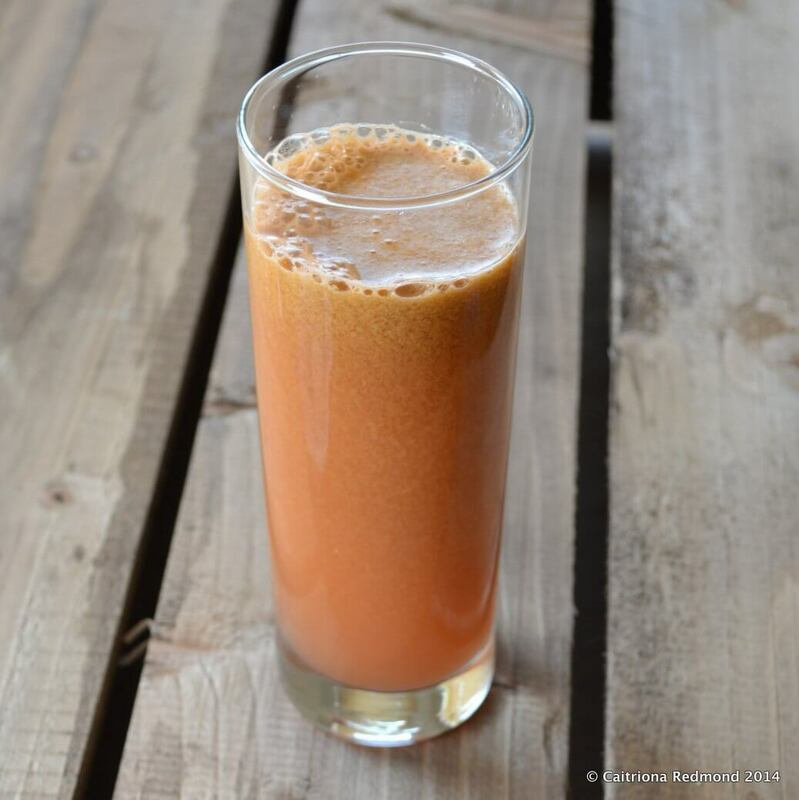 Here are 3 juice recipes that I have used over the past month. I don’t do a juice-diet but I do include them in my daily calorie allowance so that I get more raw food with micro-nutrients. You will see sediment in the glasses, that’s because I drink them straight away once they’ve come out of the juicer for optimum nutrition. First up is what I call the “Ruby Tuesday” just because I like the sound of that name! 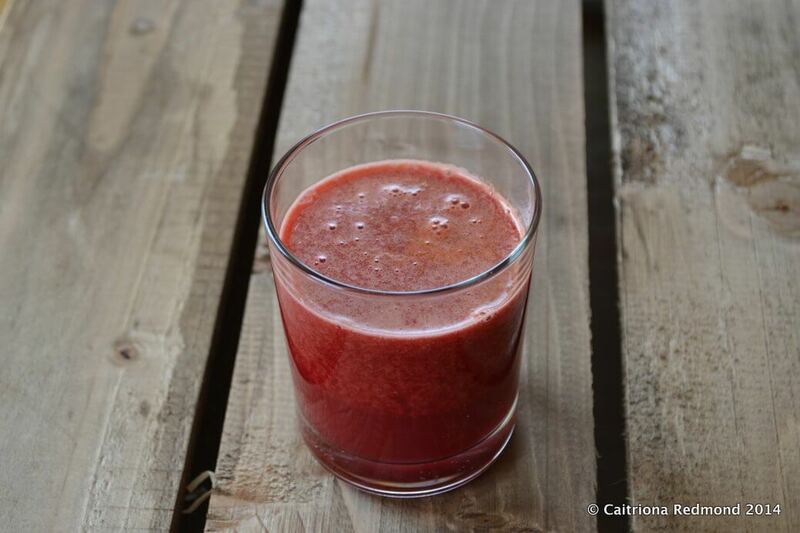 For one portion, juice 1 peeled beetroot (you may need to chop it a bit), 2 large peeled carrots, and 1 peeled red grapefruit. The kids love this one, especially the colour. Next! A “golden wonder” which is 3 large peeled carrots, 1 peeled red grapefruit and a peeled thumb-sized piece of raw ginger. It is zingy! If your kids don’t like this juice, top it off with some fresh pressed apple juice – it makes it naturally sweeter. Finally, this juice is courtesy of Vita CoCo Ireland who sent me the ingredients to try out recently. 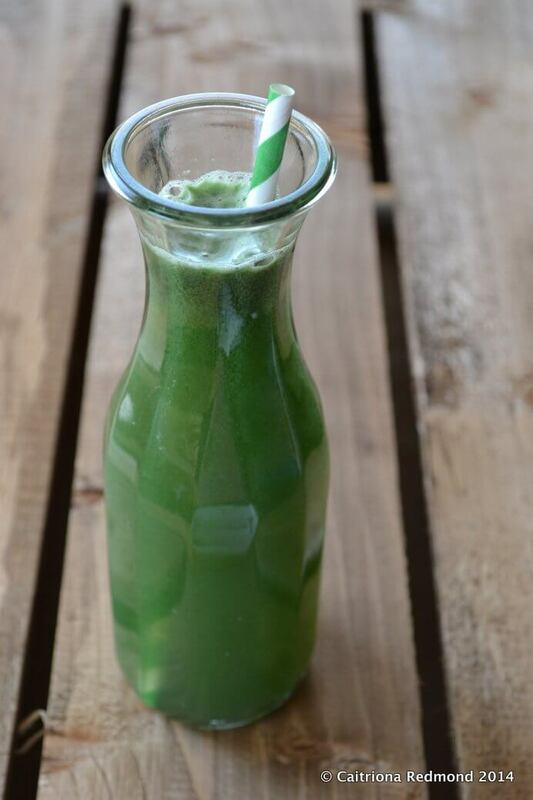 It’s a cleansing style juice and you will need to like the flavour of cucumber to drink it. You’ve been warned! Freshly juiced whole cucumber, 3 granny smiths, the juice of a lime, a handful of fresh basil, a teaspoon of Spirulina powder, and 250ml of Vita Coco pure coconut water. Thankfully my juicer is easy to clean off & I lash the parts into the dishwasher when I’m finished. I find it handy to juice fruit and vegetables separately as I re-use the vegetable pulp for making stocks and soups. I only drink a maximum of 300ml of fresh juice in a day. It makes it easier to keep on top of portion sizes. If I want to feel fuller for longer after drinking a juice, then I stir in a little natural yoghurt or add something with a high protein content to my juice like Spirulina. I’m not a professional but have learned that if I do this I’m not reaching for something to eat because of a sugar crash an hour after drinking a fresh juice! To do all this juicing I’ve been using one of the new Braun J700 juicers which I received as a gift a few months ago. They’re stocked in Arnotts, Harvey Norman, Debenham, Expert, Euronics in Ireland and the UK stockists are on that link. Disclosure: All opinions are my own and I’m not paid to give them. I am not obliged to mention any of the products listed above. I follow your blog and your recipes and do a regular wholesome weekly recipe of yours, your an inspiration! I’m like you when it comes to food all wholesome and good but with large portions. Congratulations on your weight loss it’s a great achievement, but also that your doing it the right way and not the crash diet way. Thanks for sharing. Ps your cook book is on my Christmas list! Thanks Nicola, there’s loads more to go but I’m happy things are heading in the right direction. Good luck! Looking forward to trying your recipes! Hi Caitriona, I’ve been reading your blog for the last year or so and am delighted for you!! Watched your vlog earlier too and have a quick question…how did you work out your portion sizes?? I use MyFitnessPal and a weighing scales. There’s no charge for the app and it’s available free on iOS, android & online. I’ll blog more about it soon. Not sponsored in any way! Hi Catríona, Well done on your weight loss. I’m a bit like yourself, I cook wholesome food but just have been eating too much of it and the last year has seen my weight creep up. I watched Fat,Sic and Nearly Dead 2 weeks ago and 5 days ago I started a juice programme. Down 5 lbs so far and determined to keep going. I feel so much healthier already! Thanks Ruth. Continued success on the juice programme!